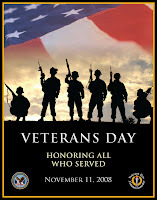 Marketing to the Military Family and Community: Happy Veterans Day! Today is a special day for our Veterans and their families. To thank and recognize these deserving men and women for their sacrifices is a critical mission for our nation. We can not forget them after they have served us so well. One great program you should consider supporting on this day of recognition is the Wounded Warrior program. Wounded Warrior information can be found at their website located at Wounded Warrior Project. The site has sections on how to be a sponsor, volunteering and other ways to get involved! If you want to expand your support and participation in a program that cares about and supports the troops year round, give them a shout! Thank you for caring! The Team at MilitaryAvenue! Military Family Appreciation Month is Here!